No matter what the disability - we can help! We work with carers & homes, to provide therapeutic services for their residents, and we work with individual disabled drivers. Our ponies, volunteers, and qualified RDA Coaches provide sessions twice a week (Tuesdays and Thursdays). Our team works with our clients, and their carers, to match our services to their needs. Some clients just want to feel the joy of holding the reins, even though their disability means that the reins are connected to the pony’s head-collar, while the RDA Coach’s reins are connected to the pony’s bit! 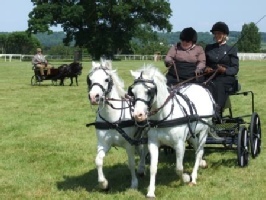 Other clients, including some with severe disability, are determined to be “in the driving seat”: their reins ARE connected to the pony’s bit (alongside those of the RDA Coach). Carriage-driving ponies don’t discriminate. They respond to their driver, no matter what disability that driver may have. It’s what you CAN do that counts!